The Monk Tikhon of Medynsk and Kaluzh, in his youth accepted monastic vows at one of the Moscow monasteries, , but through his love for solitude he settled at an isolated spot near Maloyaroslavl'. He pursued asceticism in a deep dense forest, on the bank of the River Vepreika, in the hollow of an aged giant oak. Once during the time of an hunt prince Vasilii Yaroslavich (grandson of Vladimir the Brave), having come upon the Monk Tikhon, angrily ordered him to immediately quit his domain, and made bold to raise his lash against the monk. The hand of the prince grew immediately numb. Taken aback by such punishment, the prince repented of his conduct and with humility asked forgiveness. He received healing through the prayer of Saint Tikhon. The prince entreated the monk to remain always in his domain and build there a monastery for monks, promising to provide it all the necessities. The Monk Tikhon built a monastery in honour of the Uspenie (Dormition or Repose) of the MostHoly Mother of God, which he headed. He guided the monastery until extreme old age, and he died in the year 1492, having accepted the great monastic-schema. The body of the Monk Tikhon was buried at the cathedral church of the monastery founded by him. The celebration of the Monk Tikhon was established at the Council of 1584. 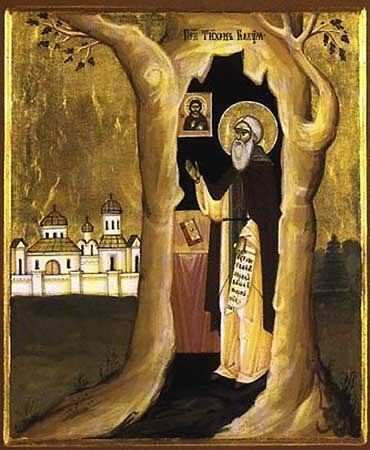 Among the disciples of the Monk Tikhon, particularly distinguished by his sanctity of life was the Monk Nikiphor of Kaluzh. It is assumed, that he was the successor of the Monk Tikhon in guiding the monastery. The Monk Nikiphor is depicted on icons together with other Kaluzh saints: the Monk Paphnutii of Borovsk (Comm. 1 May), the Monk Tikhon of Kaluzh and Blessed Lavrentii of Kaluzh (Comm. 10 August).